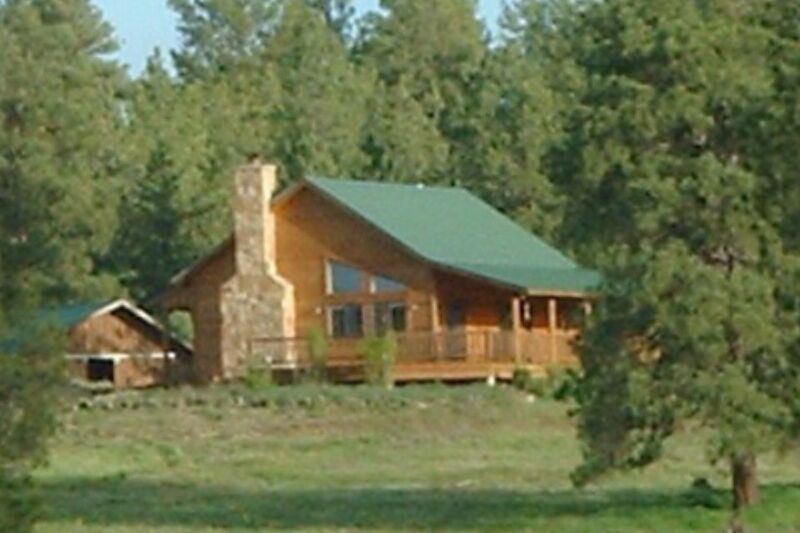 Private secluded cozy cabin and barn on 70 acres in Pagosa Springs on National Forest. Surrounded by hundreds of Ponderosa Pines with mountain views of Pagosa Peak to Navajo Peak. Hike right from the backyard or watch the natural wildlife from our deck and covered porch. Barbeque and dine on our deck while taking in breathtaking views from every direction. Relax in our living room with large windows with views and cathedral ceilings. Make a fire in our native rock wood burning fireplace. Large master bedroom with king size bed and cathedral ceiling. Private master bathroom with double sink and full bath. Second guest bedroom with queen size bed and large full bathroom with shower. A sofa couch in living room for additional guests. All linens and towels are provided. We are located in Alpine Lake Ranch development, 17 miles South of Pagosa Springs Town and famous Hot Springs. This development is 35 acre minimum which gives much beauty and privacy. This property is a 'Little Piece of Heaven'. PEACEFUL AND QUIET. You can hunt, snowshoe, cross country ski, mountain bike, hike, horseback ride right from our backyard into the San Juan National Forest. Bring your toys and horses. We have an RV hookup located on the property for additonal guests or horse trailer. Call for more details. This property is private and cozy. No light polution. Watch hundreds of stars at night on deck or covered porch. Wildlife viewing right from backyard. If you love the outdoors and nature, this property has it all. Views of Pagosa Peak to Navajo Peak. Coffee maker and toaster oven provided. Seating at dining table for six. Home has front and back covered porch with wrap around deck. Great place to relax and unwind from every day life! If you are looking for a place close to town and Wolf Creek Pass that also provides low key relaxation, this is it!! Would definitely recommend this place! Solitude is number one on the list for this cabin. You are almost 19 miles away from Pagosa Springs proper. Thus, it can be a two-edged sword since it's a 38 mile round trip for groceries, gas, fun, and dining. The fully equipped kitchen allows for you to be self-sufficient with good planning. All you hear is birds chirping, chipmunks running on the deck, and the aerial combat of the hummingbirds vying for the fresh sugar water you provide. Hot coffee and a brilliant sunrise is spectacular. The cabin is small and sufficiently clean. The washer/dryer is very handy allowing you to pack much less for your trip. Mr. Boltman was very kind and went out of his way to waylay our fears concerning smoke from the fires in the area prior to our visit. The reason for the four stars is a couple of issues that need to be addressed. (1) the screen on the slider is torn in multiple places allowing flies and insects in when trying to let fresh air in to cool the cabin. (2) The BBQ was not clean enough to use (3) The fan in the livingroom does not work if needed on hot day. (4) The deck needed to be swept and washed down to remove bird droppings that appeared to be there for some time. All these things are easy fixes, then a five star rating would be appropriate for this vacation spot. We would gladly visit the cabin again. One other thing may be of interest. IF you have any mobility problems it could be a challenge for you to open the gates on the long driveway. We are senior citizens and my husband has sciatica problems but he fared well. Don't hesitate to give Private Cozy Cabin a chance. You forget how quiet the world can be away from the madding crowds. Solitude wonderful solitude!!!! The property was fine however it rained 2 of the 4 days we were there and the San Juan National forest was closed due to fire hazard. Also parts of the Rio Grande National forest were closed as well. Not a lot to do in Pagosa Springs and wild life in this area were very sparse as we enjoy nature hiking and photography so not such an exciting trip for us. Wonderful property to get away from it all. Just what we were looking for! This property is PERFECT for peace and quiet. Chipmunks, hummingbirds, and other birds who were nesting in various places. A joy to watch! Gazing out from the deck across the pastoral setting with the mountains in the background brings tranquility to the soul. The cabin was very comfortable and well equipped. The pictures don't do justice to either the cabin or the landscape. Sound like Heaven? It is. We will DEFINITELY return. If you're looking to get away from it all, really get away, then this is for you. Quiet, cozy, relaxing cabin out in the beautiful CO country. A quick 20min from town, 45min from the ski area, or just stay and hike the area, plenty to do. Enjoy! Just what we were looking for. Good location. The night sky was beautiful. Pagosa Springs famous 17 Hot springs, Chimney Rock, and Parelli Natural Horsemanship International Study Center. Durango Train Ride. Wolf Creek Ski area.